1. Personal-Physical Fears: the one thing that happens to us all the moment we are born, that we can be 100% sure will happen in this life is decay and death. I’ve jokingly confessed, “I don’t fear death; but I just don’t want to be there when it happens!” Being elderly has disadvantages and even if you try doing things you once did, you don’t quite enjoy them the same way! The Bible does tell us how old Simeon was; tradition says 113 years. Anna with him was a poor 84-year widow. As physical faculties fail, fears set in and health concerns are inevitable! 2. Social-Financial Fears: Coupled to inability to work/earn is the depleting or disappearing of one’s finances. This creates an increasing dependence on others, especially family and loved ones. Godly, aging, grandparents usually don’t want to be a burden to their children or others. This puts them in a precarious to-ask-or-not-to-ask situation. Older folk feel neglect, loneliness and withdraw, panic or lose the will to live! As in Bible times, our society takes advantage of and exploits widows, so the church is charged to care for them in their distress! 1. Perception: We who have eyes need Simeon’s spiritual insight and vision of hope. Physically there wasn’t much to differentiate the baby, the Spirit reveled truth and Simeon in faith obeyed so his eyes did see God’s salvation in Christ. He recognized Mary was there for her purification, yet her presentation of the child was nothing else than God’s offer of salvation for “all nations”. 2. 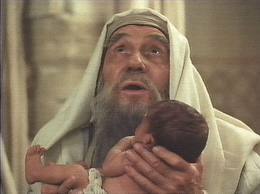 Reception: Simeon took this baby in his arms and saw the glory of God in the face of Jesus! This was his defining moment, Israel’s red-letter day and the focal point of world history. At last God had spoken His final Word: Jesus – the believer’s only hope of glory! Simeon’s life-long quest now realized in receiving God’s salvation, he asks to be dismissed from service in peace! 3. Adoration: Simeon had waited long enough now in worship he witnesses to so great a salvation. His prophetic song brought clarity and confirmation to Christ’s earthly parents, Israel, the Gentiles and was joy to the world. Simeon’s and our Lord takes away sin and one day all sufferings but importantly Christ came to bring salvation! It’s Life and Health and Peace! I’m eager to grow old gracefully. Simeon shows us how! We must be insightful: perceive how God has worked and receive his “great salvation” before death! As we age let’s be graceful: full of gratitude for today, a gift and lease of life. We are not just getting older we are nearer home [whose afraid of going “home”? unless in trouble with Dad!] Finally like Simeon and Anna in the temple stay useful: serving God assured of strength for today and bright hope for tomorrow! I wonder what eulogies were said at Simeon’s funeral service?! But his was in deed a life of faith “just and devout,” with a living hope “waiting for the consolation of Israel,” and amidst fears of aging he had a constant, loving companion: “the Holy Ghost was upon him.” What an epitaph to have!